Ovenden West Riding rounded off another excellent season by retaining the West Riding County Amateur League’s Premier Division Cup on Saturday. Danny Megson’s side beat Campion 3-1 in the final at Deighton to make it two trophies in 10 days. Andy Bailey, who had scored both goals in the 2-1 Halifax FA Saturday Cup win over Brighouse Town’s development side at the Shay, bagged two more in a man of the match performance. 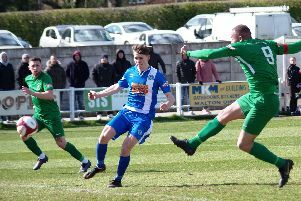 Campion caused West Riding plenty of problems in the early stages due to the aerial power of Steve Hollingsworth and the midfield prowess of Steve Baugh and Liam Charles. Ovenden were struggling to cope with the blustery conditions but Mat Jones and Robbie Graham eventually got hold of the midfield. By then Hollingsworth had put his side one up, when he got the better of Graham Hall to beat Chris Moroney from six yards in the 20th minute. Ovenden came more into the game with Jay Carney impressing. Bailey was a growing threat and on 30 minutes he swept home a Jones free kick, past Ivan Willis, from 15 yards. In the second half West riding eventually got on top. On 65 minutes a Carney run and inter-passing with a generally subdued John Booth resulted in Carney firing past Willis from 10 yards. Campion were struggling to mount any king of threat by now and on 75 minutes Booth’s persistence paid off when his excellent right wing centre was met by Bailey’s head to settle matters.